I’m sure many are jumping into Monster Hunter: World on PC with a controller in hand, as it seems like the natural things to do. But as I said in my PC Port Report, I honestly prefer using a keyboard and mouse with a few modifications. It’s crazy to think that not too long ago I was thanking the Monster Hunter gods that I could use the little new 3DS nub for the camera, and now I have full mouse-control over it! Here are a few of the control edits I made to make the experience as smooth as possible on a keyboard and mouse. The best way to handle remapping the keys is to have a mouse with more than the standard three buttons. We want to make your left hand focus on moving and dodging, and that’s it. The first thing I did was add mouse 4 to the guard hotkey. I played a lot of Lance and this felt very comfortable. This way, my right hand performs all of my non-movement actions and my left hand is left simply to focus on positioning. Holding Ctrl and trying to move and reposition felt awful, so I knew that had to be changed immediately. The same can be done for ranged weapons. The beauty of these hotkeys is that the game separates melee and ranged, so you can assign the same button to more than one thing. Here, I used mouse 4 for aiming. As you can see, I used the (Press Once) method, but I went back and forth a few times and tested out both versions. I’m honestly not sure which I liked better overall, but I switched off of ranged weapons before needed to make a full decision. Regardless, play around with both and see what works best for you. Again, this is an attempt to alleviate actions from the left hand when the right hand can do them instead. The default for going through items is to hold Q and then click the left and right mouse button to cycle. While not unbearable, I found myself trying to move and hold Q at the same time and struggling, so I shifted it to yet another mouse button. This is a very important change to make if you are using the mouse and keyboard. Bring up the options menu and change the Radial Menu Type to Keyboard. 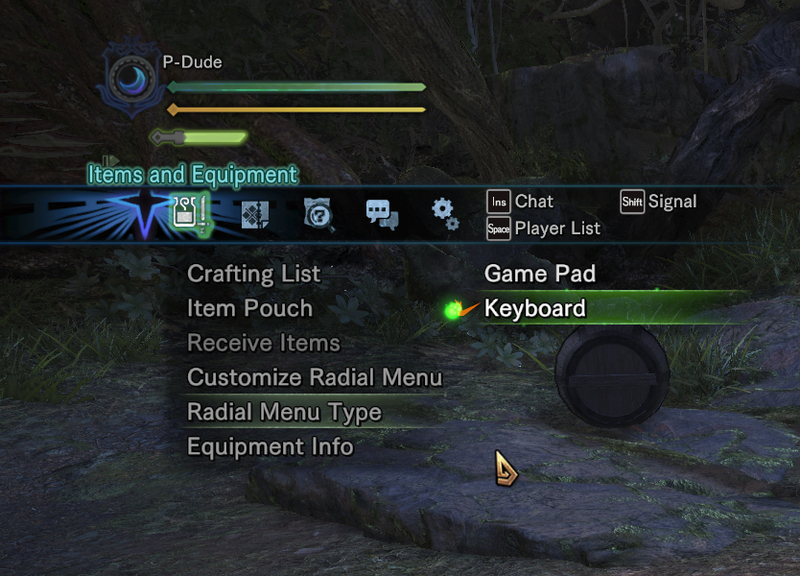 This changes the default radial menu (which does not work with WASD controls) to the F keys. Unfortunately, this cannot be bound to anything else, so get used to hitting at least F1 for those quick-access items. This is a must-change option; the other mode is just about useless. To customize what’s on those menus, simply hit the Customize Radial Menu that’s right above the Radial Menu Type option. While the Radial Menu is linked to the F keys and cannot be changed, if your keyboard has firmware that allows for extra buttons to be remapped, take advantage of that! I use the Razer BlackWidow Ultimate keyboard and have done just that, as seen below. 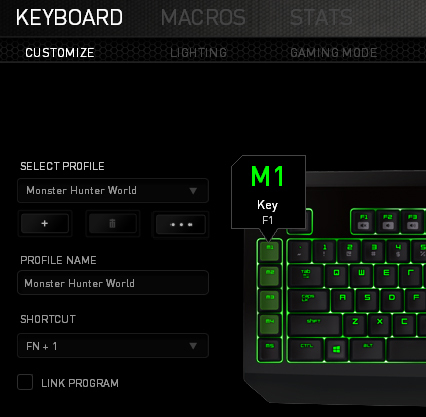 The M keys that are so conveniently located on the left of the keyboard are way easier for me to hit when playing the game, so I bound them to the F keys and simply use them instead. The slinger being bound to V is something that I didn’t end up changing, even though I thought I would. I wanted to use E, but that’s bound to use item, which is important. You’ll be using the slinger more than you might think (especially once you learn where those Wedge Beetles are), so this has to be something you’re comfortable with. I use the V key a lot in games, mostly as push-to-talk, so I got comfortable using the V key here. If you take Ctrl off of block/aim, you may want to use it here. One last thing that I will say is that Tab is not used, outside of looking at items in the Smithy. It’s a bit out of the way for your fingers, so I wouldn’t use it for something you’ll have to get at quickly, but it’s a handy key to keep in mind when looking over the controls. And that’s about it! Only small tweaks required, the biggest of which is assigning things to the extra mouse buttons, provided you have them. It may still sound crazy to some, but I think that using a mouse and keyboard is the best way to play Monster Hunter: World, regardless of the weapon in your hunter’s hands.